"There are many phenomena around us that use circular movement. Earth orbits around the Sun, winds work in a circular pattern, after night there's a day, whole planet works in seasons. The ambient sound of the album is also meant to move constantly. Compositions on the album tell stories. Happy toys refers to my childhood and the feeling of joy during drumming on a toy drum. Sidereal Hesitation is about long life questions of humanity for example - does god exist or not? And I don't mean Christian god but the force that drives nature. Most of sounds are impressions about my feelings when I'm experiencing nature. This music is also my escape from the daily routine that's often blocking my perception of reality outside of work and day to day duties. The sounds of this album are meant to bring the listener closer to that near nature state of mind and simple beauty of the world. The cover photo is taken with analog camera by mother when I was young. The fact that I'm using photo taken by my mother is also an expression of circular movement of feelings and values between generations." 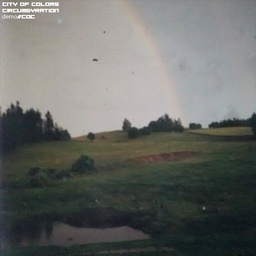 Circumgyration is the first EP by CITYOFCOLORS from Poland. Yctapom Short Movie is attached to the EP.